You can use the Messages app on your iPod touch to send and receive instant text messages with other iOS devices (such as iPhones, iPads, and other iPod touches) and Macs running Mountain Lion or newer operating systems. 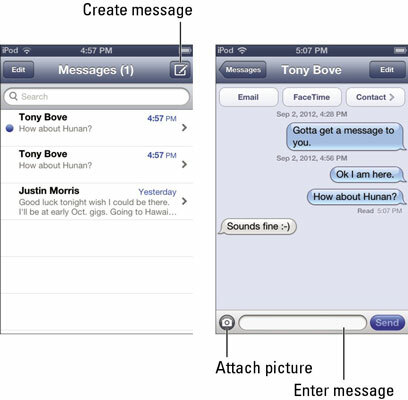 Messages uses the iMessage protocol. Unlike cellphone texting (SMS and MMS), iMessage is completely free and works over Wi-Fi. You can even send photos, videos, locations, and contacts with your messages. It’s easy to conduct conversations with people because you can see when each person is typing a message (and there’s no shouting, although you’re welcome to use ALL CAPS). When you first set up your iPod touch, the Messaging screen appears as part of the setup screens showing your e-mail addresses. You can select any or all of your e-mail addresses that others can use to send messages to you. You can also do this at any time by choosing Settings→Messages→Send & Receive, and selecting your e-mail accounts. You can also select which e-mail account to use as the From account for new messages. When your iPod touch receives a message, it can automatically display an alert on your lock screen (unless you turn this option off — choose Settings→Messages to turn the View in Lock Screen option on or off). Slide the slider to go right into the Messages app, where you can reply to the message, if you want. You can view and send messages by tapping the Messages app. The Messages screen appears with a list of conversations. A blue dot appears next to any conversation that has one or more unread messages. Tap a conversation to see its messages, which are organized into conversations. Outgoing messages appear in colored balloons, and incoming messages appear in white balloons. You can tap the message entry field at the bottom of the screen to bring up the onscreen keyboard and add a reply to the conversation. The reply is sent to all who received the conversation. Scroll the conversation screen to the top (or tap the status bar to get there quickly) to see the rest of the messages in the conversation. If there are many messages, the Load Earlier Messages button appears; tap it to see earlier messages. To return to the Messages screen, tap Messages in the upper-left corner. Tap the create message icon in the upper-right corner of the Messages screen. The New Message screen appears with the onscreen keyboard and the To: field. Tap the plus (+) icon to add a contact to the To: field. Tap a contact, and then tap an e-mail address or iPhone phone number. The contact is added to the To: field. If a red exclamation point appears next to the contact in the To: field, the contact has not designated the e-mail address or phone number for receiving messages. You can repeat Steps 2–3 to continue to add more contacts for a group conversation. Enter the message and tap Send. Use the onscreen keyboard to enter the message. To send a photo or video with your message or with a reply, tap the camera icon on the left side of the message entry field. You can then tap Take Photo or Video to use the iPod touch camera, or tap Choose Existing to choose an existing picture from your iPod touch photo albums or Camera Roll. To send your location from the Maps app in a message, tap the location icon in Maps to find your location, tap the pin for your location to show the Location screen, tap Share Location, and then tap Message. You can delete part of a conversation or an entire conversation from the Messages app without disturbing the other conversations. Tap Edit in the top-right corner of the conversation screen to see the editing screen. Tap to select each part of the conversation that you want to delete, and then tap Delete at the bottom of the editing screen. To clear an entire conversation, tap Clear All in the upper-left corner of the editing screen. You can also forward an entire conversation to someone else. Tap Edit in the top-right corner of the conversation screen, select each part of the conversation that you want to forward, and then tap Forward at the bottom of the editing screen. Want to let the others in a conversation know that you read their messages? Choose Settings→Messages and turn on the Send Read Receipts option. You can use Emoji characters in your messages by activating the Emoji keyboard, and then tapping the globe symbol on the keyboard to show the Emoji characters.